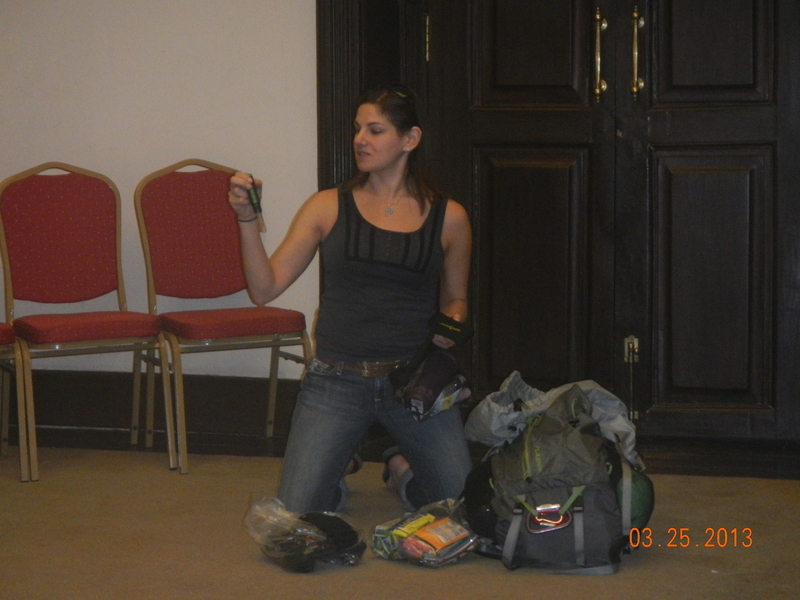 Hands-on lecture on What to Put in Your Wilderness Medicine Kit. Breaking down my kit. Preparation – Know the adventure you’ve signed up for and train accordingly. Don’t show up surprised about the level of exertion or topography when the info is readily available months before the trip. Look at a gear list, or build your own, and test it all out ahead of time. Water Filtration – choose a method (I like the UV light) and a back-up plan (I carry chlorine tabs). 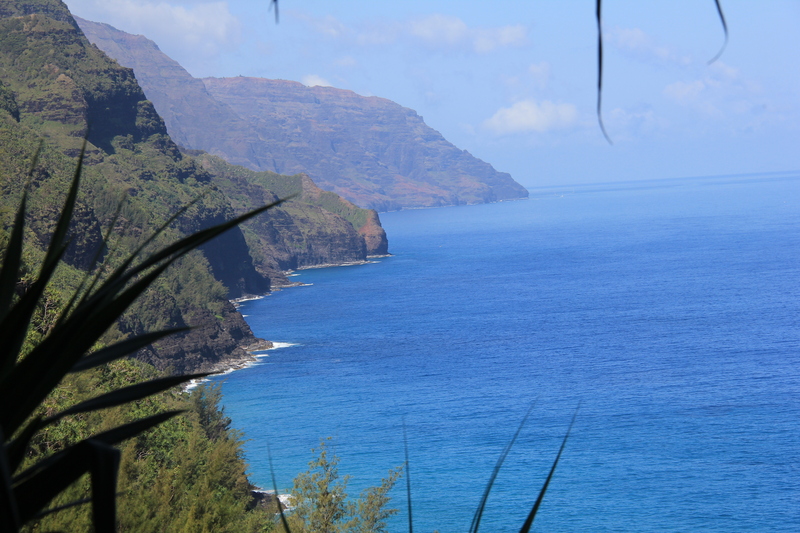 On a recent trip to Kauai, my first trip to Hawaii, I wanted to see the famously beautiful Napali Coast. 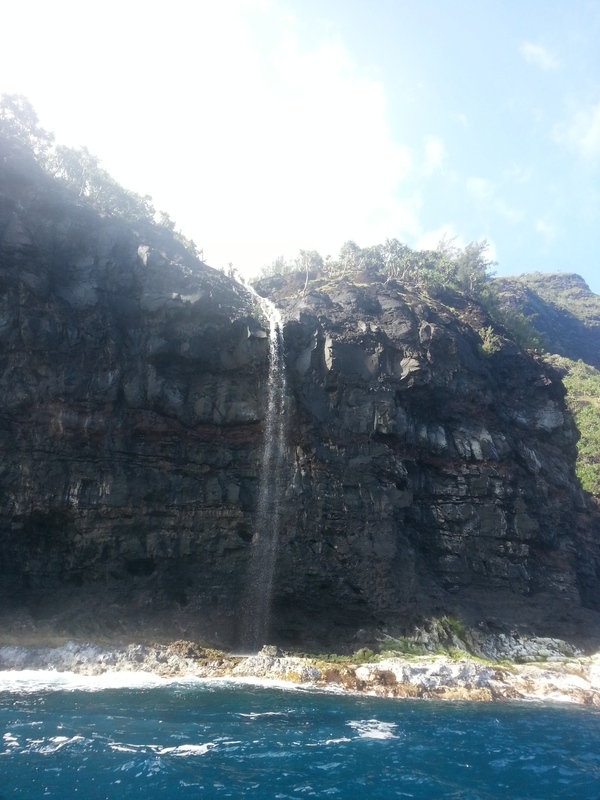 From what I’d heard and read, backpacking the Kalalau Trail was the way to go. 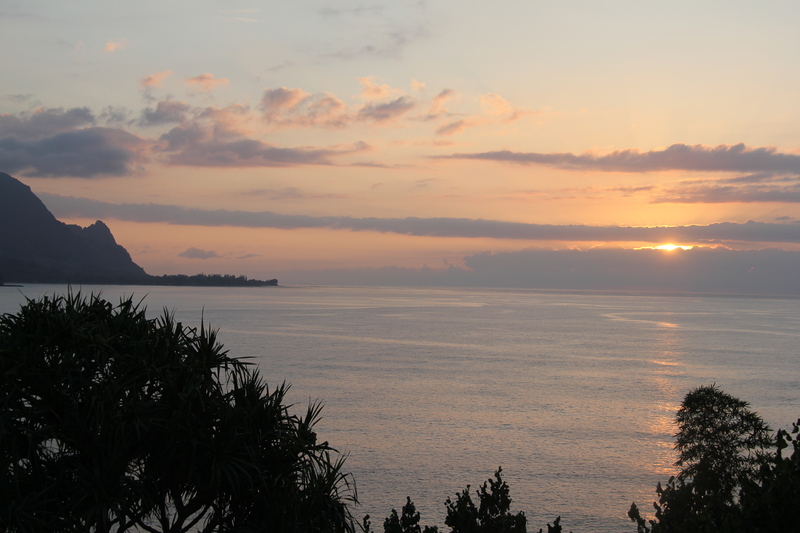 The Kalalau Trail appears on many “Most Beautiful Hikes” lists. As it turns out, you need to obtain permits for that sort of thing about 12 months ahead of time, which is not exactly how I roll. Plan B. I still wanted to check out the Napali Coast in an adventurous way so I found this option: get in the water! 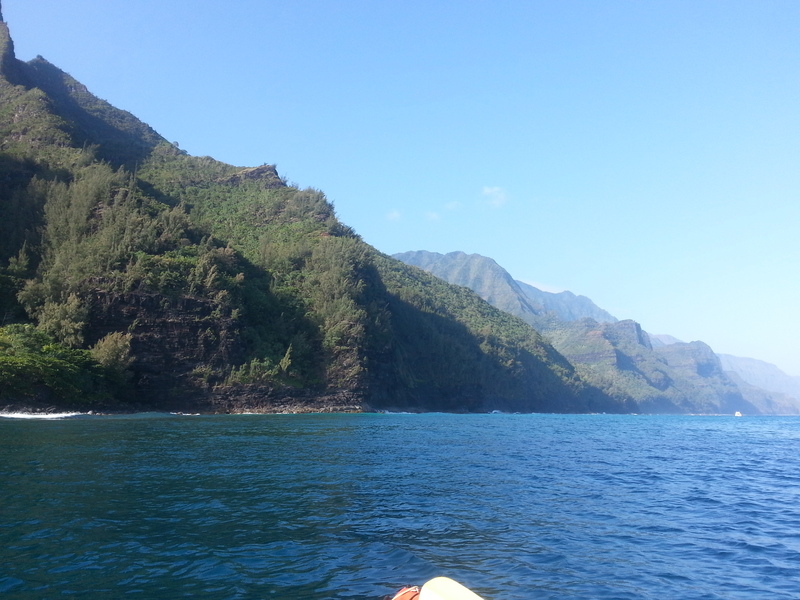 You can kayak up the entire Napali Coast; all 17 miles of it! Hands down this is some of the most beautiful scenery I’ve ever had the privilege of experiencing. Now, I’ve done some time in boats, but I’m not the strongest paddler, so I did some research before committing. I consulted my borrowed copy of the Kauai adventure bible The Ultimate Kauai Guidebook (now I own it since it got soaked in a torrential downpour during a hike on the Garden Island). 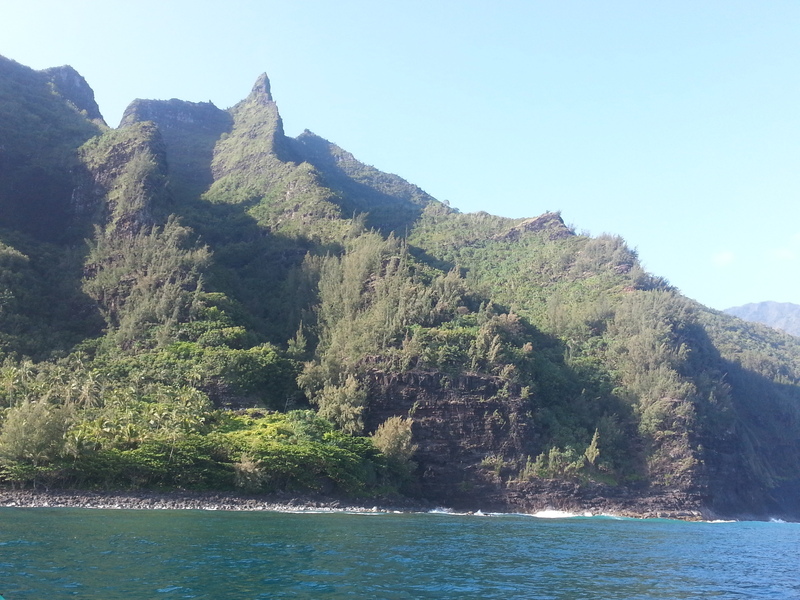 Conclusion – Napali Coast, here I come! On the website, the guiding company recommends Dramamine, the medicine people use for motion sickness. At first I just dismissed it. I’ve sea kayaked along the coast of Catalina Island, in La Jolla Coves, rafted the upper 86 miles of the Colorado RIver through the Grand Canyon, and canoed for miles without ever getting sea-sick. My dilemma brought back memories of deciding whether or not to take Diamox, the medicine used to prevent and treat Acute Mountain Sickness (AMS), on my trek to Everest Base Camp. Ultimately, having never experienced AMS and on the advice of other experienced WM trekker friends, I decided not to take it preventively, but to have it as a treatment plan in case I got sick. As it turned out, I acclimatized quite well without the Diamox until about 16,500 feet as I approached Gorakshep, the last Tea House before Everest Base Camp. At that point, Diamox (and a rest day) did its job. I developed a similar plan for my kayak trip. My WM Kit was appropriately stocked with meds in case I (or anyone else) got sick. On the ride to the put-in, there was a lot of meclizine and Dramamine being passed around the van. There was a plea from Siro and Casey, our guides, to just take it. The week before they had an ex-Navy Seal on the trip who declined to take it and then proceeded to puke his way up the entire Napali Coast. Yeah well, I’ve also seen Navy Seals cry and then pass out when you put IVs in them. Finally I asked the guides, “Do you take it?” Siro and Casey both said no. So we set out on our adventure. 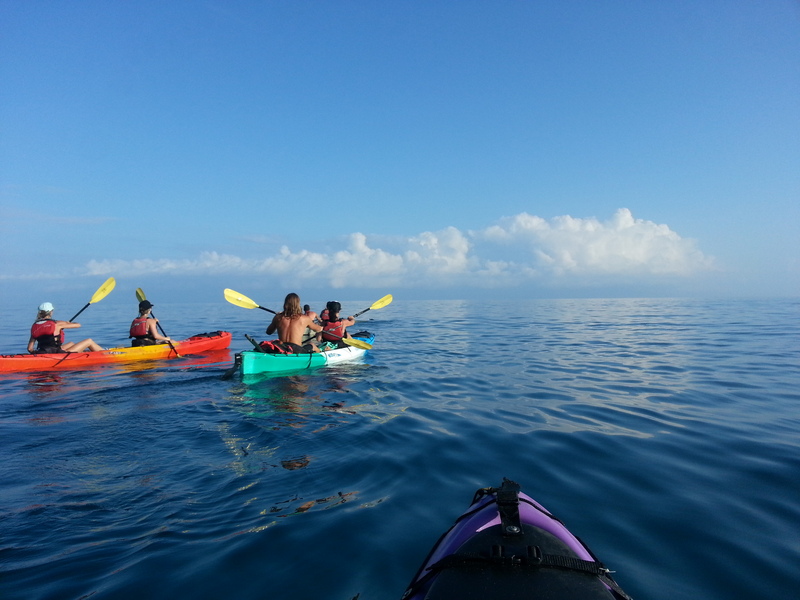 By 7:30 am we were paddling alongside four perfectly synchronized spinner dolphins that were so beautiful to watch that I didn’t even reach for the camera. The paddle continued in magical fashion revealing sites like the real life Bali Hai (as sung about in the great Rodgers and Hammerstein musical “South Pacific”), the cliffs of the Kalalau Trail, the never-ending horizon in the middle of the Pacific Ocean, and open-ceiling sea caves. That pic of the open-ceiling cave was my last of the day. 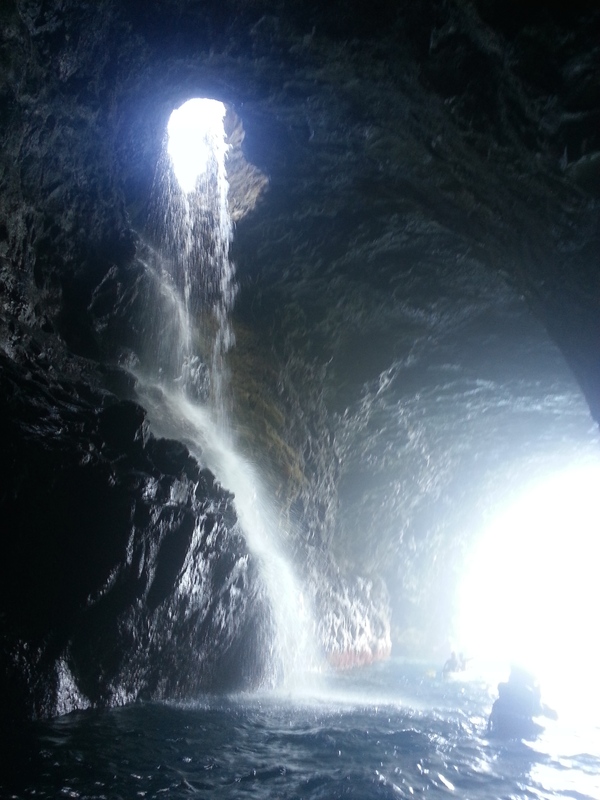 As we exited the sea cave around mile nine and paused for a swim and bathroom break, I felt “fall asleep” tired. I had not taken the Dramamine. What was going on? Sitting back in the kayak, setting my eyes on the horizon, all of a sudden it hit me. I turned around to my partner to say these fateful words, “I’m going to puke.” Four times over the side of the boat, no casualties. Eight mg of odansetron, 10 mg of metoclopromide, 25 mg of donated meclizine from another physician on the trip, a lunch break, and a one hour nap later, I was good to go for miles 10-17! And though I don’t have the photo to prove it, landing at Polihale Beach was nothing short of spectacular. Looking back at the reasoning, I can’t say I would’ve made a different decision, even in the face of an “I told you so” look that my partner tried and failed at hiding when he handed me all those meds on the boat. In fact, the one other barfer on the trip was one of the last-minute partakers of the drugs in the van. The one variable is that I am a physician, and one with some experience in the backcountry. Enough experience to know I always want to have some anti-nausea meds on me for any trip in the wilderness. Without that contingency plan, I might’ve made a different choice. Seeing my own reasoning now in black and white, if I were my own patient my advice would have been to take the freakin’ meclizine. Now lo and behold, there is a new medicine in my Wilderness Medicine Kit.